When released, the resulting cloud of repellent sends a danger signal to sharks in the area that a predator could be nearby. This creates a temporary safety zone. 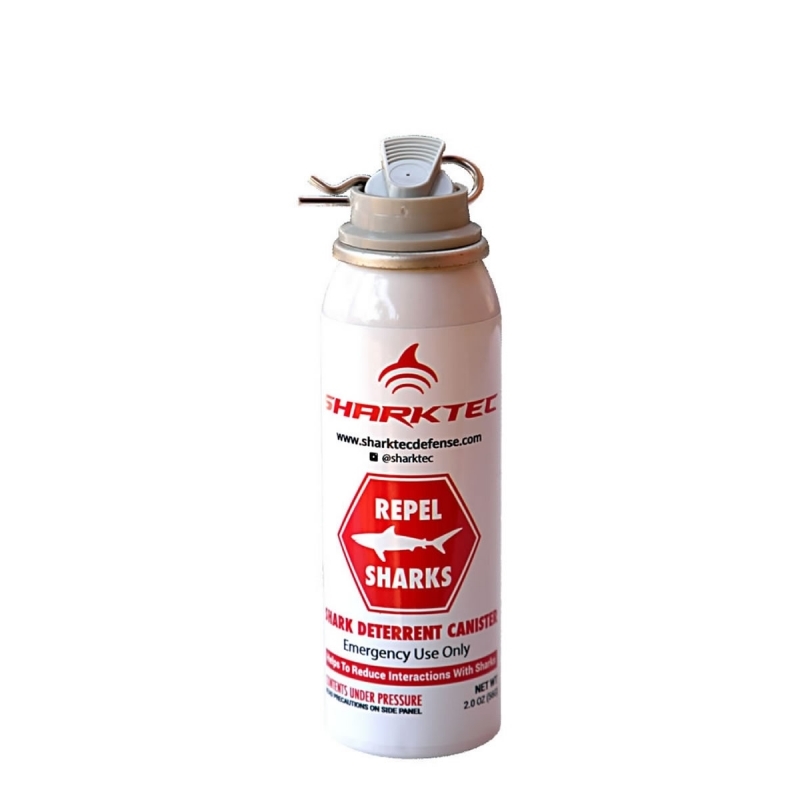 SharkTec&apos;s shark repellent spray is composed of 100% natural, biodegradable materials. The usage of the product does not harm sharks or wildlife and is safe for the environment. Our product is intended to be dispersed under water or at the water surface when there is a shark in the vicinity. The repellent is 75ml of a proprietary semiochemical composite of Lamniform and Carcarhiniform. The propellant contains dry Nitrogen (150psig/10atm). The can is an aluminum one piece, DOT 2P with a white enamel coating. The can passes the 113’F water-bath test for mechanical integrity. According to TSA restrictions you are allowed to carry 4 cans of SharkTec on checked luggage. We offer a 1.5oz canister that is 4 inches in height and 3 inches in circumference, which fits easily in the palm of your hand. You can easily attach a strap and put it on your wrist, wetsuit, gearbag, BCD, or anywhere else. Click the link below for more detailed information about how to use the repellent and other commonly asked questions. Note: Follow the guidelines on how to properly take care of the product to ensure the product will operate effectively over time. Sharks incredible sense of smell has been well documented and serves both as a way of seeking out prey and avoiding danger. Shark Repellant Spray is a composite of extracts from putrefied shark tissues called a “semio chemical”, or chemical signal. When released, the cloud of repellent sends a danger signal to any shark in the area indicating that a predator could be nearby, thus creating a temporary safety zone for the user. In 2001 Dr. Eric M. Stroud (SharkTec Board Member) began his qualitative analysis of semio chemical extractions on captive sharks. In 2003, with the help of Dr. Samuel Gruber, Grant Johnson and the Bimini Biological Field Station he was able to document a number of successful field tests on wild feeding sharks. The results of these tests were presented May 26th-31st, 2004 at the Joint Meeting of Ichtyologists and Herpetologists in Norman, Oklahoma. 13 field tests were conducted between 2005-2010 and the results were published in the scientific journal- Ocean and Coastal Management. The tests were conducted at Triangle Rocks, South Bimini and the highest number of sharks present for a single trial was 12. The testing involved using chum to initiate competitively-feeding populations of Caribbean reef sharks and Blacknose sharks and then releasing the chemicals using pressurized aerosol canisters at the surface. The number of sharks in the testing area were counted at the initial, 1 min and 5 min intervals after preliminary exposure to the repellent. ?In both shark species, an unambiguous halt in feeding behavior was observed within 1 min after product was released resulting in 100% of the sharks to leave the area for every trial conducted. Sharks were not deterred by alternative control tests. The product induced a spectacular alarm response in interacting sharks resulting in a temporary evacuation of the area containing the feeding stimuli. The aversive behaviors were often violent, with sharks rapidly accelerating away from the chemical plume. Returning sharks were always Caribbean Reef sharks; blacknose sharks did not return after chemical exposure within this period. The returning Caribbean Reef population was always less than half of the initial population and these sharks were noticeably disinterested in feeding. It appeared that sharks were investigating food that had fallen to the seafloor, a dramatic contrast to competitive surface feeding. For all tests conducted at Triangle Rocks, South Bimini over a five year period, aversion behaviors were unambiguous and sudden, with sharks losing interest in feeding and accelerating beyond visual range within 1 min of local dispersion of the chemical. The existence of a putative chemical shark repellent has been confirmed.